Last visited by Rocko February 15, 2014. The Pair-a-Dice Casino is a good walk Southwest of Trinsic, but well worth the trip should you decide to make it. 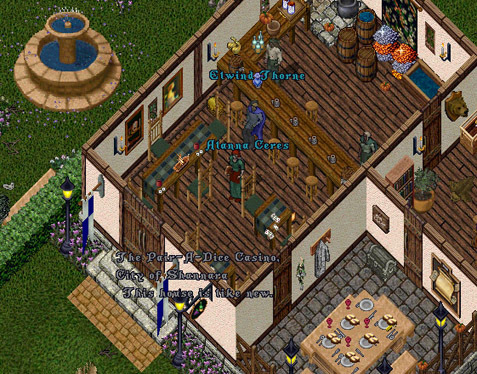 As the central gathering point of the village of Shannara, they offer good food, good company, and fine games to play while you wait for your food.The village welcomes others to hold events around town and is more than willing to lend a helping hand. 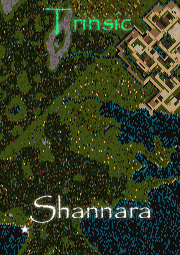 Shannara is currently attempting to build a large group of merchants in town to supply travelers. They are off to a good start with very fair prices on goods. If you are looking for a quiet place to take a special person, the gardens outside the Casino are perfect. While you visit our stablemaster (who can usually be found Northeast of the Casino) will be glad to tend to your pets needs.